When Larry, Curly and Moe hit the casino last year with the introduction of the first Three Stooges online slot game, it was an instant hit. Nick, nick, nick! The sequel, launched this week at many RTG casinos but only one where the default currency is South African Rands. 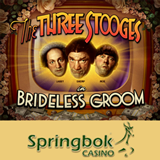 Springbok Casino players are invited to try the new Three Stooges Brideless Groom and get an up to R2500 casino bonus. The Three Stooges Brideless Groom is a sequel to the very popular The Three Stooges III slot that launched last year. Until the end of February players can claim an up to R2500 casino bonus to try the new game by entering coupon code BRIDELESS when they deposit. The Three Stooges Brideless Groom is a 33 payline slot game with bonus features that award free spins, multipliers and even Whacky Wilds. Its animated Three Stooges wild symbol triggers a re-spins feature when it appears on the middle reel. When it appears on reels 2, 3 or 4 it triggers the Stooge Picks feature where players try to find two pieces of a broken heart to win free spins, Whacky Wilds or increased bet multipliers. The Lucky Stooge Feature that awards up to 33 free spins can be randomly triggered at the end of any spin. Springbok players can also get double comp points on the Game of the Month, Aladdin’s Wishes. Further details of these and other special casino bonus offers are available at http://www.springbokcasino.co.za/promotions. This newe game is not yet available in the mobile casino but Three Stooges III mobile slot game is one of the most popular mobile slots in the world.